Kyoso and Choki Shin first saw the Caboose motel just a few months ago, on March 18. They had been looking online for a business to buy someplace with wide open spaces and friendly people. The couple already had some campground property in West Yellowstone, and an Italian restaurant in Salt Lake City. “We were driving a long way, past a lot of lakes and beautiful rivers,” Kyoso Shin recalled, warm and charming, Kyoso has been here only one month, holding down the fort alone until her husband returns from Salt Lake City where he is tying up loose ends. She knows her hotel is in a good location and is very anxious to learn about what Libby has to offer, so she can offer guests useful and relevant information to help them enjoy their visit. She would like to work with the Libby Chamber of Commerce, to create an attraction map for visitors. The couple loves the landscape and loves to fish. “We like to go fishing and catch a lot of fish,” she added with a grin. Although the Shins plan to keep most things, including the hotel’s name the same, Kyoso is planning to update and spruce the place up. The Shins are very happy to be here. We do want to be part of the community and we are already working with Achievements,” she said. Kyoso and Choki Shin are eager to learn all about Libby, and hope townsfolk will drop in with a hearty Montana welcome and tidbits about our town to share. 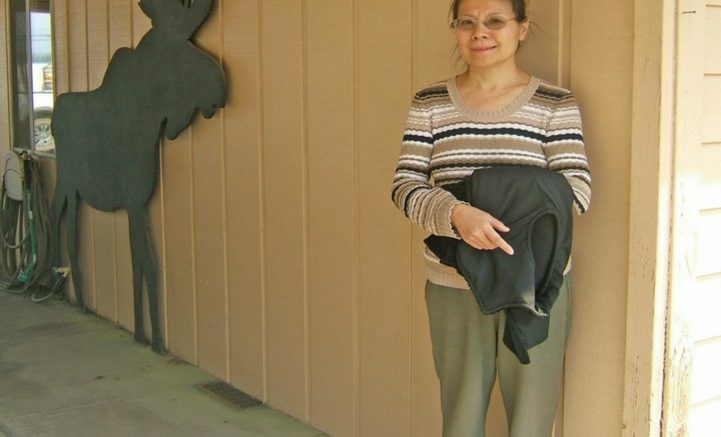 Kyoso Shin, and her husband Choki (not shown in pic) are the new owners of the downtown Caboose motel.